Saw Palm's mission is to go beyond the tourist brochures and capture the unique experience of Florida lives, landscapes, and tropes through the work of artists and writers in-state and out. Established as a web journal in 2006 by John Henry Fleming and the graduate students of the Creative Writing Program at the University of South Florida, Saw Palm began publishing a print edition and taking subscriptions in 2008. ​Each yearly issue features both print and web editions with work unique to each. We offer a mix of stories, essays, poems, book reviews, and visual art that speaks to the diversity and uniqueness of Florida. Our contributors include national and international award-winners, as well as emerging artists and writers, many of whom are published for the first time here. ​​Please look through the selection of postcards, pick one to write about, and submit written work inspired by this art (creative nonfiction, fiction and poetry!). 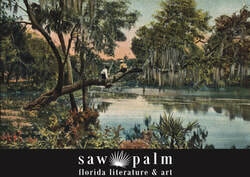 Issue 13 of Saw Palm: Florida Literature and Art (2018) is now available for purchase. Order today or subscribe now.